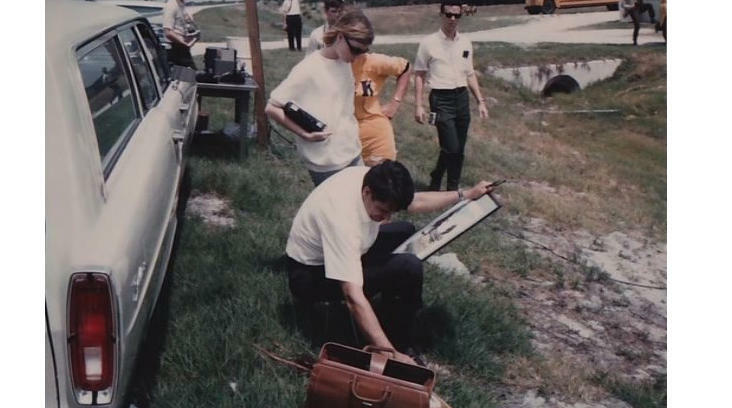 Soon after immigrating to America in 1960, Moncini, an aircraft mechanic with an aptitude for art, found himself doing technical drawings and space-related paintings at NASA's Marshall Space Flight Center in Huntsville, Alabama. That was his day job, but on his own time, Moncini traveled to every launch of the Gemini and Apollo programs at Cape Canaveral/Kennedy and painted - the spacecraft waiting on launch pads, firey blast-offs, even futuristic space scenes and more - for his own enjoyment. His work eventually caught the eye of the Center's director, legendary rocket scientist Werhner von Braun. It was not long before von Braun was taking Moncini's paintings of rockets and outer space to Washington, D.C. to help him sell the space program to Congressional budget writers. Moncini recalled von Braun as "very understanding and intelligent. I think he was pretty happy (with my paintings) because he was using the stuff to go to Washington and then try to get the money." Many of the artist's works were designed as educational tools to teach both scientists and astronauts how the various space vehicles and mechanisms would look and operate. One piece of technology was so secret he could only paint it based on random pieces brought to him by a NASA official. "(he said) 'let's call it Project Moonshine.' What I found out later on, it was a laser. At that time it was so secret. It was 1965." After leaving NASA in the 1970s, Moncini continued his career painting factories and plants from blueprints for Daniel Construction, now Fluor Daniel, in Greenville. His friend Terry Norris considers him a "renaissance man," as his artistic talents also extend to wood-carving and other interests. He continues to paint in his retirement, and considers himself fortunate to have had a front row seat to history.